Over 90 years of excellence. More than 80 million safe miles. At least 18 million remarkable passenger experiences. Even though your company was not able to beat a competitor’s cost, I chose JRT because of the service you provided. Your quick-turn around time responding to my questions and your flexibility with providing my team with options swayed my decision to choose service over cost for my department’s outing. Thank you for your excellent service. I just wanted to say Thank You to you and your staff for such an outstanding job during our NUSA conference. Your company and employees are second to none. It was a pleasure working with you and I will always recommend James River Bus Lines in the future. You guys are wonderful to work with. We use you every year for our field trip for K-12 teachers. Reservations are handled promptly and expertly, and the coaches are always super-clean and pleasant to ride in, with friendly and knowledgeable drivers. I have to say that working with your company is one of the easiest and smoothest parts of my job! Thank you once again for all of your support and leadership during our WYSE and WJMC conferences. We had a wonderful time working with your drivers and even took a moment to celebrate Wilbur’s birthday! Please let Ernie, Wilbur, John, and Tim know that they are absolutely fantastic. They were very patient, understanding, and punctual. They were always positive and delightful to work with. I am not always with the buses, but I know that our staff and students are in good hands. Thank you for supplying us with such wonderful, polite, and enthusiastic drivers. Please add them to our preferred driver list. I will definitely be requesting those same drivers for future events. James River Transportation is the best! My DH and I live in Chester, and we like to travel frequently. When we travel, we always call on James River to get us to and from the Richmond Airport. They are easy to book on-line and are always reliable and prompt. Their cars are clean and well taken care of. The drivers are polite, courteous, helpful, safety-conscious, friendly, respectful, and professional. They are very customer oriented and aim to please. As I said, they are the best! From the minute your driver picked us up at the Marriott Hotel in downtown Norfolk to the minute he dropped us off late that afternoon, he was fabulous. Not only was he a safe and cautious driver, but he seemed so interested in the tour our group was taking. It turned out that he was a history buff, and he was able to add so much information about the Tidewater area for these women who had come from all around the country. We all learned so much and everyone had a wonderful time. Thank you for arranging the bus transportation for our Mid Atlantic Regional meeting held in Williamsburg last week. The driver did a wonderful job for us despite the heavy rain and traffic conditions. 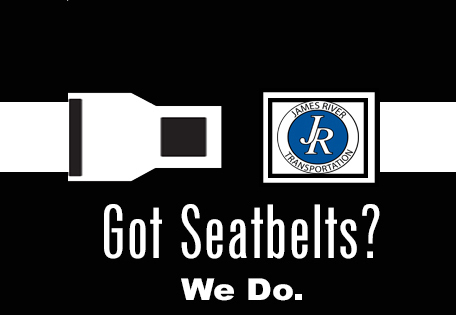 He was very professional and courteous and represented James River Transportation well. We will keep you in mind for our future transportation needs.